Hurricane Bud is seen in an infrared satellite image capture. 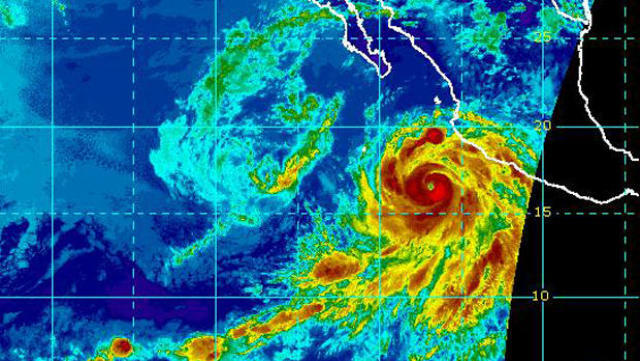 Hurricane Bud grew to Category 3 force off Mexico’s Pacific coast on Monday. Forecasters said it was likely to weaken before a possible brush with the resort-dotted southern tip of the Baja California peninsula late in the week. The U.S. National Hurricane Center said Bud had maximum sustained winds of 120 mph Monday morning. It was centered about 265 miles south-southwest of Cabo Corrientes, Mexico, and was moving northwest at 7 mph. Forecasters said Bud was expected to strengthen further before a slow weakening trend starts on Tuesday. 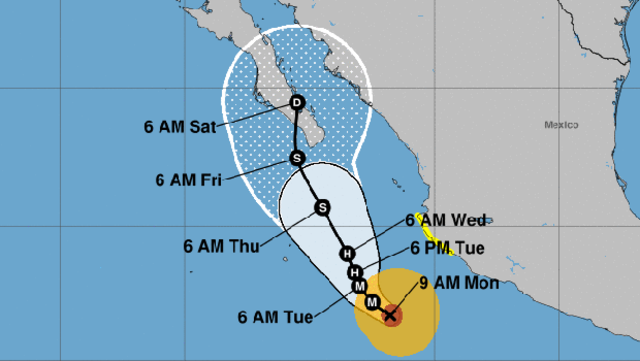 “Significantly cooler waters around the southern tip of Baja California should reduce Bud’s intensity below hurricane status before it reaches that land,” the center said. Hurricane Bud’s probable path off Mexico’s Pacific coast is displayed in this graphic from the National Weather Service. The hurricane center said the storm could generate swells that cause life-threatening surf and rip currents over the coming days along Mexico’s southwestern coast. Rainfall of 3 to 6 inches, with isolated patches of 10 inches, was possible into Tuesday afternoon. Meanwhile, Tropical Storm Aletta weakened into a tropical depression in the Pacific Ocean far off the Mexican coast and was expected to degenerate further and become a remnant low-pressure system later in the day. The hurricane center said it had maximum sustained winds of 35 mph. The storm peaked on Friday as a Category 4 hurricane with winds of 140 mph.